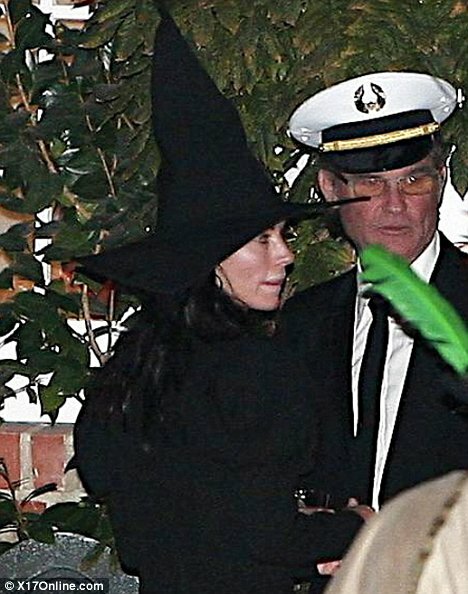 Courteney Cox traded red carpet glamour for scary new look at a star studded Hallowe’en party over the weekend. The former Friends star and her husband, David Arquette, arrived at a bash held by Kate Hudson dressed as a witch and wizard – complete matching pointy hats. Supermodel Cindy Crawford was also spotted at the A-list do in Brentwood, Los Angeles, giving her best impersonation of Amy Winehouse at the bash. Beehive stacked high, make-up caked on her face and arms covered in mock tattoos, the supermodel’s resemblance to the troubled singer was uncanny as she arrived at the star-studded event. She opted for a strappy leopard print dress and huge hoop earrings to complete Amy’s trademark look. Kate Hudson’s step-father Kurt Russell looked dapper as a smartly turned-out sea captain. And Spider-man actor Tobey Maguire, 33, wore a lumberjack shirt and a baseball cap emblazoned with the legend: ‘I love my white trash wife’. Across town at a separate party, Gwen Stefani won the prize for the most bizarre costume after dressing up as a fried egg.